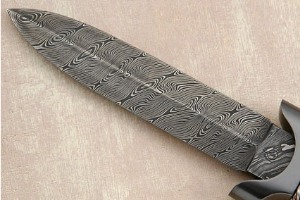 Blade thickness (near bolster): 1.05 in. Description: Jot Singh Khalsa studied art, jewelry making and metalsmithing at the State University of New York at New Paltz, where he learned to work with fine metals to create beautiful pieces of wearable art. 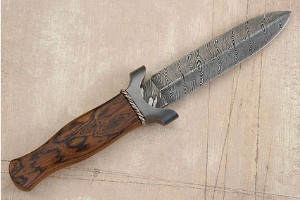 Soon after, he attended the inaugural New York City knife show - and was so impressed by what he saw that he was inspired to diversify his metalworking skills and begin creating edged art. 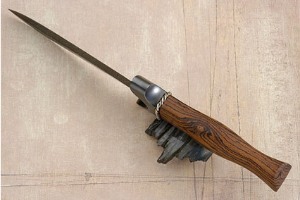 Jot has now been making knives, swords and kirpans (a sword or dagger carried by many Sikhs) full-time since 1978. This piece by Jot is a sturdy little dagger that is incredibly elegant. 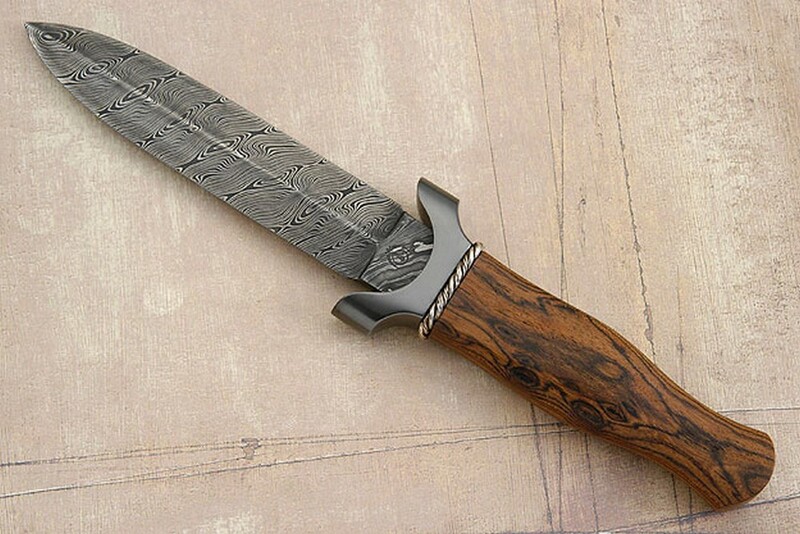 The beautiful simplicity of the dagger's lines are complemented by the maker's choice of materials - the damascus blade combined carbon steel with nickel, creating a dramatic and high-contrast pattern that is set off perfectly by the simple, symmetrical dagger grind. A hot blued mild steel guard meets a twisted sterling silver spacer, continuing the lines of the knife's design perfectly. 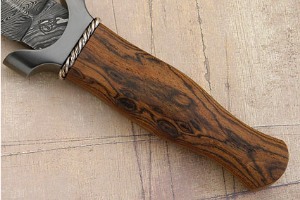 The bocote wood handle is masterfully shaped, filling the palm and balanced so the knife feels effortless in the hand. 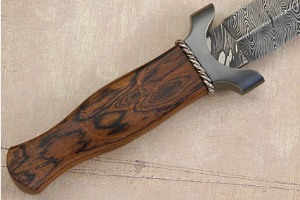 The swirls and ripples of the wood grain match the damascus blade well. This knife has been in a private collection and has been meticulously cared for since it was first made in 1994. It is in new condition.